Extra eyelashes/Distichia: these are eyelashes growing right on the edge of the eyelid from the openings of eyelid glands. 2-3% of US CERF examinations have distichiasis. If fine and in low numbers, they are unlikely to cause irritation. Surgery is required if they are causing clinical signs, including squinting, watery discharge and corneal ulcers. PPM (persistent pupillary membrane): PPM are usually strands of iris tissue that did not dissolve completely during the formation of the eye. They can be fine or thick and can run from the iris to iris, lens or the cornea. Iris to iris strands that are fine are of no concern, however iris to lens or iris to cornea strands result in an opacity at the attachment site. Breeding not advised. Cataract: these are opacities in the lens. The lens should be crystal clear for perfect vision. With age, the lens will develop a cloudy/blue appearance but this needs to be differentiated from cataracts. Age-related change just causes problems with focusing. Any cataract in a young animal should be considered to be inherited and breeding is not advised. Lens Luxation: This occurs when the zonules holding the lens either degenerate or break. Many terrier breeds are predisposed to this. The lens either falls backwards or comes forward and blocks drainage in the eye resulting in glaucoma. This is painful and surgery is required to relieve pain. If diagnosed early, lens removal surgery may be performed to try to save vision in the eye. Dogs affected with this condition are not suitable for breeding. Persistent Hyaloid Artery: The hyaloid artery supplies blood to the lens during development of the eye. Once the eye is fully formed, blood flow in this artery stops and it is resorbed (fades away). If this process is not complete, an eye may have a persistent hyaloid artery. This can be related to more severe developmental problems. A dog affected with this is unlikely to have issues (although there is a chance that the vessel could bleed) however breeding is not advised. Vitreous degeneration: The vitreous is the jelly at the back of the eye. Sometimes this goes through premature ageing and opacities and floaters can develop. In severe cases, vision is affected. Furthermore, the once firm vitreous that used to support the lens liquefies (changes from a thick gel to a watery substance), then lens loses its support and zonules may then break, leading to lens luxation. Retinal atrophy (generalised): This condition is known as PRA – progressive retinal atrophy and is seen in many breeds. It is an inherited condition whereby the retina (nerve tissue) undergoes degeneration/thinning and results in vision loss. Initially there is night blindness, followed by day blindness and later cataracts. Affected dogs may be blind as young as 2 years old, however the more common age for blindness is 5-8 years old. Breeding is not advised, however with DNA testing, affected dogs may be bred to clear dogs to create a whole litter of carrier dogs. Geographic retinal dysplasia: Many breeds may be affected with this condition. It is a more severe form of multi- focal retinal dysplasia, in which folds are seen in the retina. In these cases, there are multiple folds that line up to form a ring. The retina within the ring is predisposed to retinal detachment. Breeding is most definitely not advised. Optic disc coloboma: This is also a developmental condition whereby the optic nerve head has not formed properly and there is missing nerve tissue in the form of a hole. These can also predispose the eye to retinal detachment and large holes can affect vision. Breeding not advised. Glaucoma: Primary glaucoma develops as a result of a malformed drainage angle. The normal drainage angle allows easy flow of the fluid produced inside the eye (aqueous) into the drainage angle, and into the bloodstream. If normal flow holes are not formed, at some point the drainage becomes compromised, and the intraocular pressure increases. This is glaucoma, and high pressure in the eye is painful and causes vision loss by stopping blood flow to the nerve tissue (optic nerve and retina). Corneal ulcers: A corneal ulcer occurs when there is a breach in the surface of the eye = cornea. They are usually caused by trauma (e.g. scratch) but are more common in dogs with oversized eyelid openings, dry eye, extra eyelashes and ectopic cilia (ingrown eyelashes). Most corneal ulcers when treated early can be resolved. Surgery is required in some cases if the cause if due to an eyelash or the eyelid openings are enormous and recurrent ulcers are occurring. Tear readings should always be measured once the ulcers have healed to rule out dry eye as an underlying cause. Pigmentary keratitis: This condition is extremely common in Pugs with 50% of Pugs having some degree of pigment develop on the cornea. It is also seen in Griffons. It is usually due to eyelid conformation (oversize or entropion = inward rolling eyelids). Treatment includes Tacrolimus drops, and or surgery to burr the pigment off and corrective eyelid surgery. As a general rule, in a breed with very few recorded problems, eye certification may be performed at 1-2 years of age (prior to first breeding). 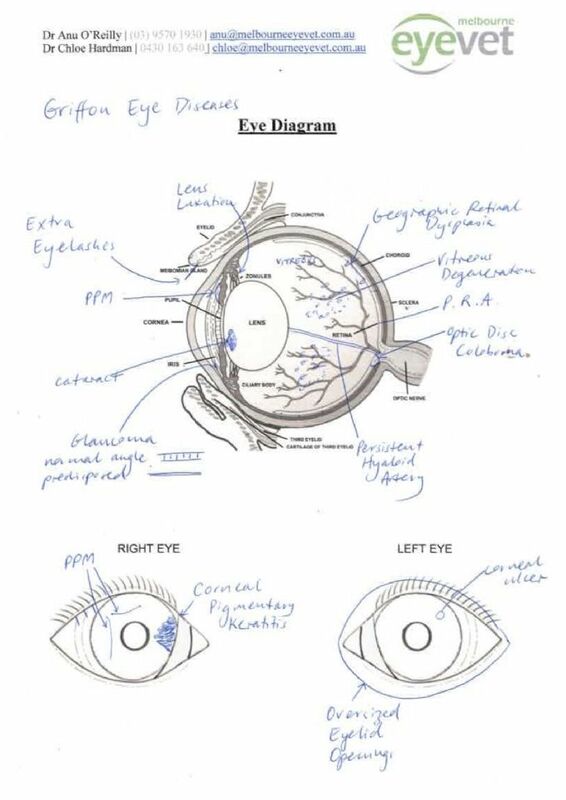 This will enable examination for extra eyelashes, eyelid size and conformation, persistent pupillary membrane, persistent hyaloid artery, geographic retinal dysplasia, optic disc coloboma and predisposition to glaucoma (gonioscopy). It will also examine for cataract, lens laxity and retinal atrophy, however these may still develop at a later age. A check around 4-5 years of age and a final check around 8 years of age (if clear this will clear the dog of inherited eye disease) will be able to give breeders a clear picture of what their breeding stock is developing. on last year, the apparent lack of evidence of a major threat to vision is encouraging. More useful data could be produced with sample sizes >10%. These results are published in the ‘Blue Book’ (see references). This is available as a download and found online when you search for ‘Blue Book’. There are currently no health-related DNA tests available for the Brussels Griffon in Australia, UK or the USA. In the near future tests should be available for PRA and syringomyelia.